A conference room is an essential area of your office space. Without a conference room, employees are forced to meet with each other as well as clients in their own offices, which could be too small for the occasion. When you begin to design your new conference room, it is important to keep a few things in mind. Atmosphere- It is important to have an understanding of the type of atmosphere you want for your conference room. If you want a more welcoming and comfortable atmosphere, have a round table as your conference room table. This allows everyone to sit on the same level and promotes positive collaboration. If you prefer a more serious atmosphere, choose a rectangular table that allows one person at the top of the table. The type of atmosphere you choose will also help determine the colors used in the conference room as well. Size- Before you purchase any furniture for your conference room, consider the amount of space you have to work with. Choose a table that will fit within the space comfortably and choose chairs that will allow individuals to sit with appropriate space in between them. 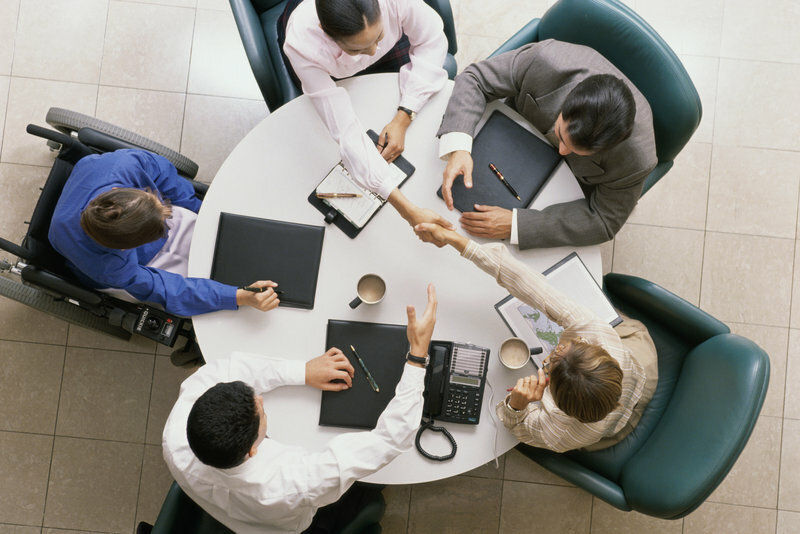 Having a table and chairs that fail to fit properly in the conference room can affect productivity during meetings. Functionality- Consider what functions will be needed from your conference room table. If you plan on using electronic devices like laptops or tablets, your table should have appropriate room for a power supply. If you plan to use video or phone conferencing functions within your conference room, have your layout embrace those functions. Décor- Choose an appropriate color scheme for your conference room before you choose a table, chairs, and artwork. Your furniture should complement each other rather than clash, and artwork should help promote creativity rather than distract from the task at hand. This entry was posted on Friday, February 20th, 2015 at 6:59 pm. Both comments and pings are currently closed.